Guides’ day off in Chile and what do you do? Throw streamers, of course. Last week a friend texted me a picture of an old streamer line, still in its original box, that he’d come across while cleaning out the garage. It was all of ten years old in human years, downright ancient in fly line years. Of course, it was a weight-forward floater, and the box affirmed it would assist in delivering “big nasties.” I looked closely at the flies depicted. Not only were they not big by today’s standards, they were also quite the opposite of nasty—like they’d be more likely to bring you breakfast in bed than give a kype-jawed brown trout the finger. It got me thinking about today’s cornucopia of streamer lines, and how grateful I am to have so many at my disposal for every river, climate, fish and application. Of course, I fish streamers a fair amount, so all that variation is a lot of fun. But then I got to thinking: what if I were just starting out, right now, smack dab in the glory days of streamer fishing? Might all those things that make the streamer game so dynamic—the virtuosic flies, the smorgasbord of lines—also make it difficult to enter into? After some thinking I decided it was quite possible that this was the case. Hence the idea for this column. To fill in holes in my own thinking about line, and to help better understand why I prefer certain lines over others in different circumstances, I spoke with Scientific Anglers R&D maestro Andrew Bosway. While I could write for thousands of words on streamer lines, my goal here is to take the information most relevant to the streamer newcomer and boil it down to a few easy principles. For that reason we’re going to limit the conversation to river lines as opposed to lake lines (that would be opening another can of big nasties). Also, to keep things simple and streamlined, I’m going to use a trio of Scientific Angler lines as my reference points, though want to be clear that all the other major line manufacturers—RIO, Airflo, Cortland, Orvis—also put out great streamer lines. The reason for sticking to one company is two-fold. First and most importantly, I think the line profiles on SA’s web pages make for the best teaching tools. Each page carries a lot of visual and numerical data about a given line. The second reason is more arbitrary: when it comes to streamer lines, I just know SA lines better, partly because they’re made just two hours north of where I live. That said, all the ideas presented below will generalize to all the aforementioned line manufacturers. First off, if we’re talking about streamer lines, it means we’re mostly talking about sinking lines. With a few exceptions, they are going to be the most useful type of line for throwing streamers. There are a few reasons for this. First off, sinking lines are going to keep your fly in the fish-catching zone that much longer longer. Secondly, once you get your stroke down, it’s much easier to sling streamers with a sinker than a floater. Third, the most innovation in the streamer designs over the last few years (and these are, as I mentioned earlier, the golden years of streamer fishing) presuppose some manner of sinking line (the more complex actions of today’s flies are usually a result of some interaction between a sinking line and the fly). So what are the basic elements you should take into account when choosing a line? In very particular order: 1) grain weight (what line best matches the rod you’ll be using), 2) the density of sink-tip coating on the head of the line (it’s line density, not grain weight, that controls the sink rate), 3) the material used for the core of the line (this controls stiffness and affects how a line handles), and 4) the coating of the shooting/handling portion of the line, which affects castability/shootability as well as how a line handles in different temperatures. First, grain weight. Ten years ago, all we really had to go on when matching a line to a rod was line weight, which was and is just a manufacturer’s interpretation of what grain is most appropriate for a given rod. Line weight designations are still used across the board, but are now usually accompanied by the grain weight of the first 30 feet of the line. In my opinion, paying attention to grain weight just makes the dialing in process of matching rod to line that much easier. You’ll get a better understanding of your tackle faster, which will in turn make it easier to buy the right rods and lines for yourself in the future. As a general rule, each rod weight has a basic grain window (the window for, say, a six-weight rod would be between 180 and 220 grains). If you’re throwing a slower rod, you might err on the light side of your rod’s grain window. An ultra-fast stick might call for something at the higher end of things. Now that you have an idea what grain weight might be best for your rod, it’s time to decide on sink rate. Sink rate is affected by the density of core coating on the sinking head of the line, usually between 25 and 35 feet. It has, I’ll say it again, nothing to do with the grain weight of the line—that’s why you can make two different 300-grain lines that sink at different rates, from floating lines to fast-sinking dredging tools. Sink rate is measured in “ips”—inches per second. 1 ips is just below the surface. 8 ips is about as aggressive a sink rate as you’re going to find. Choosing the sink rate that’s best for you comes down to thinking about the water you fish and the type of flies you’ll be fishing. 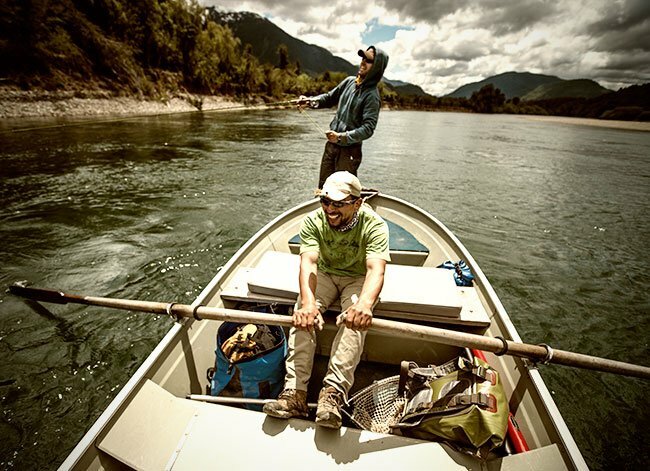 It’s not only the depth, but the speed of the river you’ll be fishing that effects sink rate. For example, a line that sinks at 6 ips will get deeper faster in a slow river than in a fast one. Is your river a shallow, slow smallmouth river full of wood? In that case, something in the 1-3 ips range, either an intermediate or slow-sinking line might do the trick. If it’s a brawler of a trout stream with long deep runs, better to go with something in the 3-8-ips range. Obviously, the deeper and/or the faster the water you want to fish, the heavier the line, but getting down in the water column isn’t the only reason to elect a denser, faster sinking line. If you like to throw large, neutrally buoyant flies like we do in Michigan for trout, smallmouth and muskie, then a denser line with a faster sink rate becomes important for helping your fly get down and stay down in current. If you primarily fish weighted flies, an aggressive sinking line might be overkill—you might find yourself having to work the fly back to the boat too quickly so as not to get hung up on the bottom. Take a look at your streamer box. What flies do you like to throw? So far we’ve talked about what sinking lines have in common: all have grain weights, all have sink rates. Where they start to diverge is in their core materials and their coatings. These affect how the lines handle and cast in a variety of temperature situations, which in turn affects how easy or difficult it is to manage your line. In dry fly fishing, line management largely refers to what you do with your line when it’s outside of the rod on the water side—how you mend and manipulate your line in current. In streamer fishing, much of line management takes place right at your feet: you’re going to hold gobs of it in your hands and pile loose nests of it up around your feet. And if you’ve got the wrong line for the job, you’re only going to make your day on the water that much more frustrating. Problems in handling tend to arise when line is too stiff or too supple for the temperature conditions at hand. Both make for tangles, aborted casts and different kinds of knots. The Scientific Anglers Wet Tip Express is an example of a line designed to remain supple and castable in cold weather. This suppleness comes from the fact that the core of the line is made from braided nylon. I actually once fished it in zero-degree weather (more because I had to than wanted to), and it remained supple enough to throw, even when my fingers were not. That said, throw this same line on a warmer smallmouth river on a July day and you might find it too limp to effectively carry your flies. For that you’d want a line with a core designed to maintain body in mild to warm temperatures. Lines of the Streamer Express fit that profile better. The core is made of a stiffer material (braided monofilament), which makes for a more supportive line that holds up to the task of delivering large flies during warmer temperatures—late spring, summer and early fall. That said, throw it on a 30-degree day in March and you’re going to have a doozy of a time with kinking. Coatings tend to be a bit more mysterious for the lay angler and rightfully so, since each line manufacturer has its own closely guarded secrets. But basically it breaks down like this: cold weather coatings get slapped on supple, cold weather lines, warm-weather coating go on stiffer, warm weather lines. One thing I’ve noticed is that cold-weather coatings tend to impair slightly the shootability of lines (in their respective ideal temperatures, an angler will be able to cast slightly farther with a Streamer Express over a Wet Tip Express). That said, there is a hybrid option for bombing it out on colder days–the Coastal Express. It’s only available in two grain weights (to be expanded in September of this year), but it combines the supple core of a cold weather line with the highly shootable coating of a warmer water line. It is definitely my preferred line for spring and fall trout fishing. It’s true that in a perfect world, you’d have a few different streamer lines for various conditions. A cold weather line for spring and fall and a warm water line for the summer months. That said, if the expense of spare spools is what keeps you from stocking up on a few different lines, you might consider using a new line organization tool for the purpose of carrying and swapping out your excess lines. The Omnispool is not quite as convenient as simply swapping out spools, but it’s still easy enough that you can get to the river in the morning, assess water and weather conditions and change lines to match them—and at a much cheaper price point than carrying a spare spool. That should be enough to get you started, streamer initiate. If you happen to live near a fly shop, this is the part where you head down for a conversation about what line or lines you’ll need to begin your practice of streamer fishing. Better yet, go in with a friend on a day of guided fishing and ask a lot of questions. There’s no better way to shorten the learning curve than learning from a dedicated guide. And as your streamer game progresses, you’ll discover there’s much more fun and experimentation in store. Just as in photography there are different ways to properly expose a photo with different combinations of ISO, shutter speed and aperture, so are there different combinations of fly, fly line, and leader for presenting a given streamer the way you want it. This article is a first step toward a very satisfying streamer virtuosity. At the very least, it will get you on the water.